VALLEY FAIR 80 • SHOPPING CENTER BUSINESS • October 2018 Though Westfield hasn't released any new tenant names, the 100 offerings to debut over this next year will focus heav- ily on food, high fashion, entertainment, first-to-market players and — no surprise — tech-savvy concepts. "Tech-wise, we get a lot of great re- tailers in this market," Vallee says. "We already have Apple, Bose, Microsoft and Amazon, but we'll see this emphasis get even bigger with our expansion. These concepts will work in Silicon Valley be- cause of our customer. 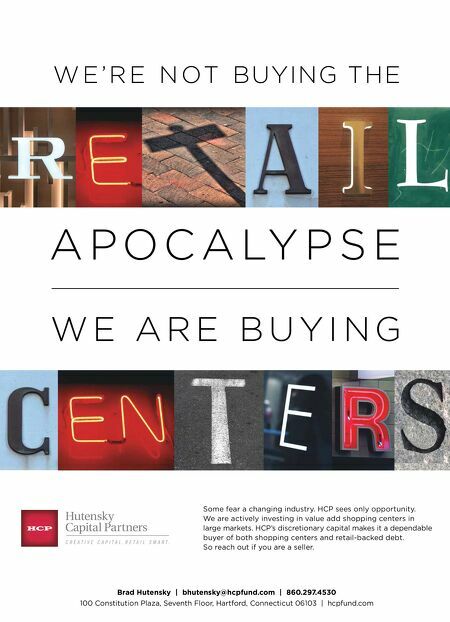 We also have a few people on the leasing team tasked with finding ecommerce companies that need storefronts." One of those companies was Morphe, an online cosmetics and makeup brushes seller that opened at Valley Fair this past November. The company maintains an Instagram following that's seven-million strong. It has since expanded to nine brick-and-mortar locations throughout the U.S., with more in the planning stages, including one at Westfield Stratford City that will open in London later this month. "Morphe has been a great addition to our center," Vallee asserts. "They're still killing it sales-wise, and we think there are a lot more ecommerce stores like this out there." CONVENIENT CLUSTERS Westfield's strategy with the Luxury Collection, where like-minded tenants are situated in close proximity to one an- other, will also be on display when the full expansion debuts. This is in an effort to combat the "go somewhere else" mental- ity that Vallee mentioned currently exists in Silicon Valley when it comes to meeting the needs of this high-end clientele across the board. "We want the center to have everything and be a one-stop place, yes, but that's not just putting retailers and services there and seeing if it works," Vallee explains. "We want to create districts with sit-down din- ing, areas with efficiencies for Mom, teens in one section and children's retailers in another. We also have the micro-fitness and health users who want these services all in one place." Event and social spaces will also be clustered — and expanded, as Valley Fair's existing public spaces are already heavily utilized. "Our center court is quite busy," Vallee continues. "With fashion shows, speak- ers, book readings, wellness events and children's hours, it gets used so much that we're building an additional space that's the same size." Public seating will be styled and de- signed based on its location within the center with the goal being to highlight that particular district's retail merchan- dise mix. The seating near Showplace ICON theater, for example, will contain a cinematic arts theme. Westfield also wants to maximize the use of this public space by taking it from daytime to nighttime — a theme that per- meates the project's design. The new retail and restaurant options will include both outdoor and indoor spaces, allowing more natural light into the center. Valley Fair's current indoor environment is be- ing revamped to embrace Northern Cali- fornia's love of mid-century modern archi- tecture, while a series of transparent glass panels will make the transition from out- doors to indoors almost imperceptible. The indoor retailers will reside under a glass roof, which replaces rear illuminated panels to create a day and night experi- ence that captures natural light in the day and creates an ambiance in the evening. This design will also give visitors a better view of the nearby Santa Cruz Mountain Range. Enhanced landscaping will rotate seasonally to further blend the "outdoor to indoor" concept. 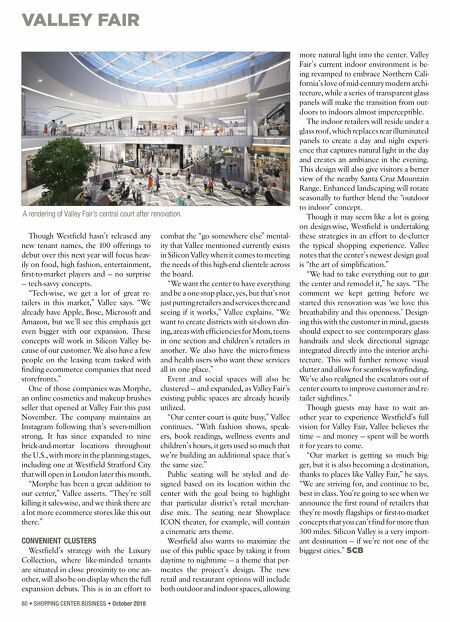 Though it may seem like a lot is going on design-wise, Westfield is undertaking these strategies in an effort to de-clutter the typical shopping experience. Vallee notes that the center's newest design goal is "the art of simplification." "We had to take everything out to gut the center and remodel it," he says. "The comment we kept getting before we started this renovation was 'we love this breathability and this openness.' Design- ing this with the customer in mind, guests should expect to see contemporary glass handrails and sleek directional signage integrated directly into the interior archi- tecture. This will further remove visual clutter and allow for seamless wayfinding. We've also realigned the escalators out of center courts to improve customer and re- tailer sightlines." Though guests may have to wait an- other year to experience Westfield's full vision for Valley Fair, Vallee believes the time — and money — spent will be worth it for years to come. "Our market is getting so much big- ger, but it is also becoming a destination, thanks to places like Valley Fair," he says. "We are striving for, and continue to be, best in class. You're going to see when we announce the first round of retailers that they're mostly flagships or first-to-market concepts that you can't find for more than 300 miles. Silicon Valley is a very import- ant destination — if we're not one of the biggest cities." SCB A rendering of Valley Fair's central court after renovation.